How to Simplify a Fraction? Simplifying fraction is quite simple. You only have to know how to divide. “Lowest term” means the lowest equivalent fraction. Reducing the fraction to its lowest term means we need to divide a common whole number to our fraction’s numerator and denominator to obtain the lowest term. If you understand my previous post on how to obtain equivalent fractions, then this will be easy for you. This is applicable to all types of fractions. You can check my post related to the equivalent fraction if you want to review it. For instance, 1/2 is the lowest term for the fraction 6/12. How to do it? Let’s start now. Here are the easy steps on how to reduce a fraction to its lowest term. Step 1. Find the equivalent fraction by division. Step 2. Check the result in step 1. If the numerator and the denominator cannot be reduced further as it will create remainder, then the answer will be the lowest term of our fraction. Step 1. Let us divide the numerator and the denominator by 2. It will result in 8/12. Step 2. Let us repeat step 1, divide again the numerator and the denominator by 2. The result will be 4/6. Can we reduce further 4/6? Yes. Divide again the numerator and the denominator by 2. The result will be 2/3. 2/3 cannot be reduced further. Thus, the lowest term of 16/24 is 2/3. Instead of dividing continuously to find the lowest equivalent fraction, you can find the greatest common factor or GCF. Use the GCF to divide your fraction by one time only. It will save much time compared to a continuous division. This is very helpful especially if we are dealing with large numbers. Step 1. Find the GCF of the numerator and the denominator. Step 2. Divide the numerator and the denominator to our GCF. The result will be the lowest term of our fraction. Let us solve example no.1 above, but by this time, well be solving it by finding GCF. Find the lowest term of 16/24. Step 1. We need to find the GCF of 16 and 24. The GCF of 16 and 24 is 8. 8 is the largest factor that can be used to divide 16 and 24 without any remainder. Step 2. Proceed with dividing 8 to our numerator 16 and denominator 24. The result will be 2/3. Find the lowest term of 48/12. Step 1. Find the GCF of 48 and 12. The GCF of 48 and 12 is 12. This can be used to divide 48 and 12 without any remainder. Step 2. Now, divide it to our numerator and denominator. 48 divided by 12 is equal to 4. 12 divided by 12 is equal to 1. Therefore, the answer is 4/1 or we can write it as 4. An improper fraction can actually be converted into a mixed number and vice versa. The steps on how to convert an improper fraction into a mixed number will be discussed below. Step 1. Divide the numerator to our denominator by long division. Step 2. The quotient will be the mixed number. 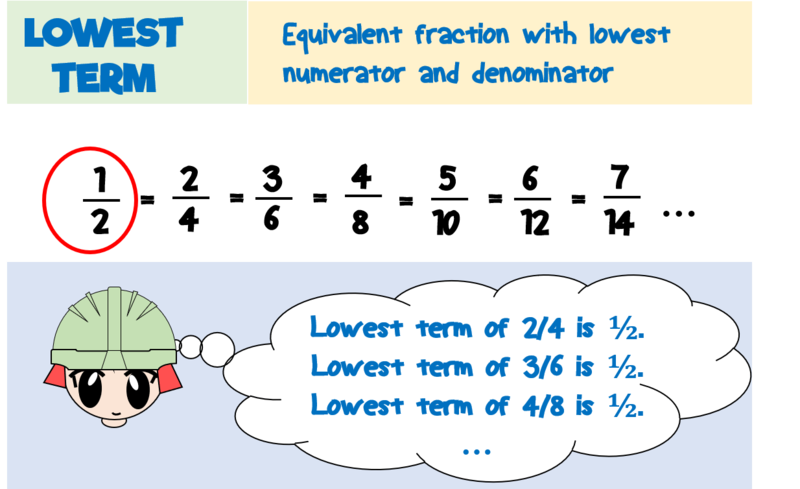 If the improper fraction is not in its lowest term, you can reduce it to its lowest term first before doing the above steps. On the other hand, it can be reduced to the lowest term after converting it to a mixed number and it will give the same result. Convert 7/3 into a mixed number. 7/3 is already in lowest term. All we have to do is to write our answer into a mixed number. Step 1. By doing the long division, 7 divided by 3 is equal to 2 with remainder 1. Step 2. Our quotient is 2 remainder 1. The whole number of our mixed number is 2. The numerator is the remainder which is equal to 1. And we just need to follow the same denominator. Thus, 7/3 is equal to 2 1/3 in a mixed number form. The answer is 2 1/3. Simplify the fraction 10/4 and write your answer into a mixed number. First, reduce the fraction to its lowest term. The GCF of 10 and 4 is 2. Divide the numerator and the denominator with 2. The result must be 5/2. The lowest term of 10/4 is 5/2. However, we need to write our answer into a mixed number. Now, do the steps on converting an improper fraction to a mixed number. Step 1. By long division, 5 divided 2 is equal to 2 with remainder 1. Step 2. Our quotient is 2 remainder 1. The whole number of our mixed number will be 2. The numerator is our remainder which is equal to 1. And we just need to follow the same denominator. Thus, 5/2 is equal to 2 1/2 in a mixed number form. The answer is 2 1/2. Step 1. Multiply the denominator to the whole number. Step 2. Add the result of step 1 to the numerator. Step 3. The result in step 2 will be the numerator of our improper fraction. Step 4. Just copy the same denominator. Convert 2 3/4 into improper fraction. Step 1. Multiply the denominator 4 to the whole number 2. The result is 8. Step 2. Add the result in step 1 which is 8 to the numerator. 8 plus 3 is equal to 11. Step 3. The result in step 2 which is 11 is the numerator of the improper fraction. Step 4. Copy the denominator which is 4. Thus our improper fraction is 11/4. 1. To simplify a proper fraction and an improper fraction, we have to find the lowest term or the lowest equivalent fraction. 2. An improper fraction can be converted into a mixed number. On the other hand, a mixed number can be converted into an improper fraction as well. If you have some questions, feel free to drop some comments in the comments section below. I will be happy to hear from you.